beautiful landscapes of Upper Swaledale"
flagged floors, beamed ceilings & open fires"
Pry House Farm Bed & Breakfast where Chris and Glenda Calvert invite you to share their Dales home, a traditional Swaledale farmhouse, thoughtfully restored to provide every modern day comfort yet still retaining the 'farmhouse feel'. Pry House faces the fell, surrounded by meadow and pasture and is less than half a mile from the source of the River Swale, from which this unique Dale takes its name. 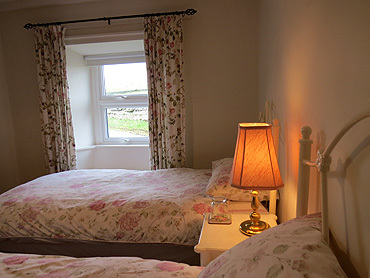 Pry House Farm Bed & Breakfast stands at the very head of Upper Swaledale, 2 miles west of the tiny hamlet of Keld. The landscape is remote and rugged but breathtakingly beautiful, dotted with traditional field barns and endless miles of dry stone walls snaking over the hillsides. The skies are massive here and the night sky magnificent. Upper Swaledale is a peaceful place; the quiet only disturbed by the call of the Peewit and Curlew, the rush of the river and bleat of Swaledale sheep. 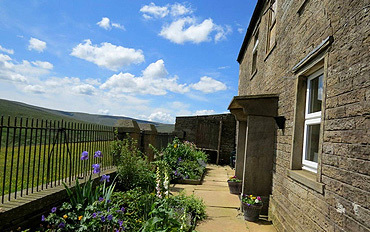 Stay in a traditional dales farmhouse on a working hill farm in beautiful, unspoilt Swaledale in the Yorkshire Dales. Peace and quiet, fresh air, vast open spaces, miles of rugged, untamed landscape to explore - a place to truly relax and unwind. 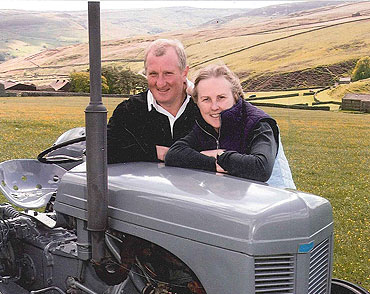 We live at Pry House Farm, a working hill farm, two miles west of Keld. Chris has farmed at the top of the dale all his adult life. I help Chris on the farm at lambing time but the rest of the year I am kept busy welcoming bed & breakfast guests into our home (April to October) and looking after Hillcrest Cottage. Pry House Farm is a working hill farm that sits 1300 feet above sea level and has majestic views all around. The peace and quiet is audible, the night skies mesmerising and the scenery stunning. Nature is all around us and the silence is broken only by the call of the curlew, the bleating of lambs and occasionally the rumble of a tractor. What is happening on the farm depends on the time you visit; April and May is lambing time, July and August haytime then there is shearing and dipping and sales so usually always something to see. Breakfast ingredients are, where possible, sourced locally supporting local businesses. Situated in the Pennine hills Pry House Farm is close to the Pennine Way, the Coast to Coast, the Herriot Way and the Swale Way. Hundreds of walkers, every year, pass through as part of their long distance walking challenge. 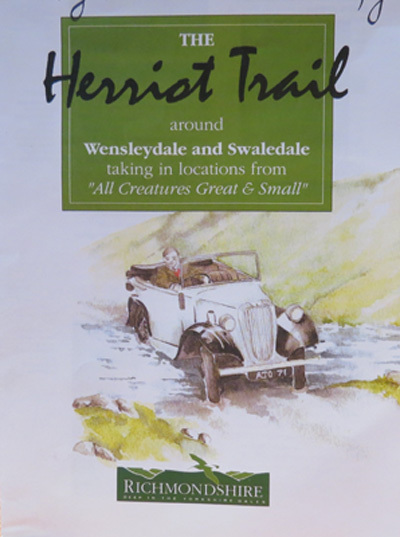 Others come to discover the dozens of public footpaths and bridleways to be found in Upper Swaledale. Pry House Farm B&B is perfectly situated to explore sections of the Pennine Way taking in Ravenseat and Tan Hill , to find the source of the Swale or conquer lesser known fells such as Rogan’s Seat (2,205 ft) and Wild Boar Fell (2323 ft). 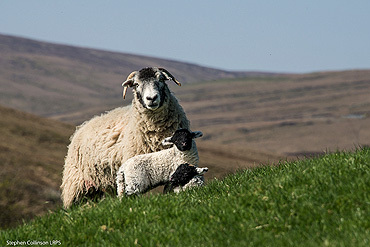 There are footpaths here for all abilities; tackle the summit of Great Shunner Fell (2349 ft) or have a go at the Swale Trail (family friendly mountain bike path) or the gentle, low level Every Barn Tells A Story walks - there’s something for everybody in Swaledale. Have a look at the YDNPA website for details of the Swale Trail and the EBTAS project. Kisdon Hill dominates between Keld and Muker but again there are several options depending on fitness or favour: over the top via the Corpse Way or follow the river Swale as it sometimes rushes, sometimes meanders along the valley bottom. At Pry House Farm B&B we have maps and books and trail guides galore including three children’s guides for local walks that the whole family can enjoy together. Let us help you plan your day. We are always happy to help, share our local knowledge and point you in the right direction – just ask. And at the end of your day, having worked up an appetite, there are several good eating and drinking places within easy reach. Try Keld Lodge or The Farmers Arms in Muker. "We had a great time. Stayed the first two nights over Easter. Glenda suggested a great local walk and had bags of other great advice too. The room, the farmhouse and the setting were all fantastic"
"When we first arrived Glenda warmly welcomed us into her and her husbands home. For our 3 night stay could not of done anything more for us and went further than we would expect from a host... "
"Glenda made us very welcome in her home. 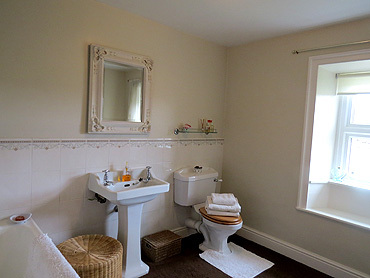 The house itself is lovely, the room was very comfortable, an en suite shower (shampoo etc. all provided), breakfast was delicious and the setting was idyllic..."
Pry House is our home so we are available at the beginning and end of every day of your stay and are happy to share our knowledge of the area, our farming lifestyle and answer all your questions about this stunning and unique corner of the Yorkshire Dales. 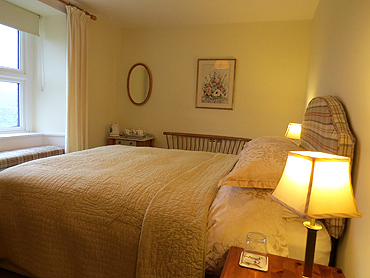 Double Ensuite Room - The double ensuite room with extremely comfy king-size bed overlooks the meadows and panoramic views of the fells. Guests are mesmerised by the views from this bedroom and struggle to tear themselves away. There is so much to see depending on the time of year you visit; lambs gamboling, hares boxing, lapwings soaring and house martins gliding. 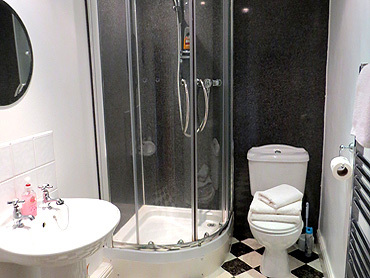 The ensuite shower room is spacious and modern with powerful shower and oodles of hot water. 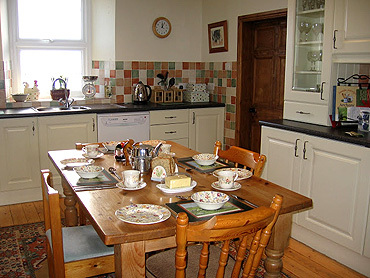 Tea and coffee making facilities are supplied in the room. Plenty of off-road parking and secure cycle storage and cycle washing facilities. Drying room for those days when you are caught out in a shower. Pry House is surrounded by traditional hay meadows, pasture and the high fells. The infant river Swale flows below the house where you will find cool pools and waterfalls to swim in. There is a plethora of wildlife to observe from every window as well as the garden. A bird watchers paradise. The ever changing skies and the light that plays on the fells is spellbinding. Zero light pollution for amazing star gazing. Comfortable guest lounge to relax in after a day out exploring the dales. Open coal fire, t.v. and lots of local interest books, magazines etc. Secure cycle store. 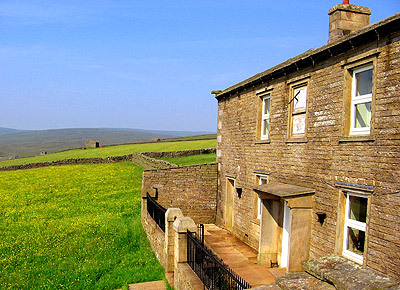 Pry House Farm is situated 2 miles west of the tiny hamlet of Keld in Upper Swaledale. 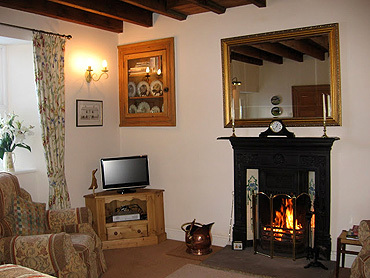 Keld has a tearoom, Information Centre and small hotel, Keld Lodge with excellent restaurant. 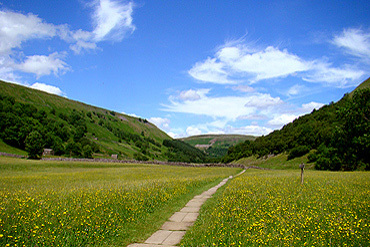 Beautiful and unspoilt, Keld is on the crossroads of two major long distance walks; Coast to Coast and Pennine Way. There are lots of cycle routes both on and off-road some a mere 2 miles from the 2014 Tour de France route. Keld has the highest concentration of waterfalls in England. During 19c lead mining was the main industry of the area. There are still remains of lead mining times to be discovered. Tan Hill Inn, 5 miles away, is the highest pub in England. Lots of good, traditional pubs, tearooms and other quality eating places very close by. A vehicle essential when staying in Upper Swaledale unless, of course, you are a long distance walker and arriving on foot! There is no public transport to Pry House Farm. Nearest station: Kirkby Stephen, Cumbria, 11 miles. Darlington (mainline station Edinburgh to London) 25 miles Nearest Airports: Teesside, Manchester, Newcastle. Breakfast is taken around the kitchen table in the farmhouse kitchen; the heart of our home. At Pry House we pride ourselves in providing a traditional Yorkshire breakfast with produce sourced locally from our butchers and greengrocers. Please advise of any FOOD ALLERGIES OR INTOLERANCES at point of booking. The guest lounge with open fire (winter months only) has an extremely comfortable sofa and chairs and is a lovely room in which to relax , watch t.v., read and reflect on the activities of the day or plan what to do tomorrow. Both our guest rooms are accessed via a private staircases making Pry House Farm ideal for families or two couples holidaying together. 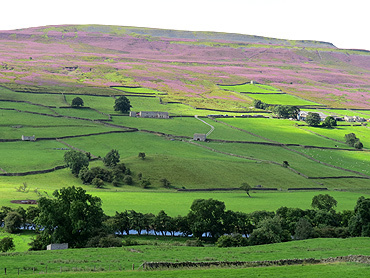 The tiny hamlet of Keld and surrounding pretty villages are protected by the Yorkshire Dales National Park authority. Traditional farming methods also contribute to the beauty of the area. High fells dotted with Swaledale sheep, miles & miles of dry stone walls snaking up the hillsides and field after field of natural hay meadows bursting with flower in late June and early July. Upper Swaledale is a paradise for walkers and lovers of the countryside but equally Pry House is ideally situated to explore the nearby Lake District, is close to several castles; Barnard Castle, Raby Castle, Bolton Castle and many other interesting attractions. There's so much to do here - come and see for yourself.